​ by Astound Property Management. We at Astound Property Management manage properties throughout Concord, Walnut Creek, and the surrounding Contra Costa and Alameda Counties. ​Conveniently close to the 242 freeway this single family home features brand new laminate flooring, recess lighting, new stainless steal appliances, and a very large versatile yard. As you walk through the main entrance you are welcomed into the bright family room that has a wood burning fire place. Through the living space you have access into the kitchen with all brand new appliances. The kitchen is attached to the spacious dining area. Two bedrooms are found on the other side of the home and are split up by the full bathroom. A third bedroom is located beyond the kitchen and has access to the yard. Walk into hallway through front door leading into a beautiful living area with family room/dining room with gas fireplace. Through the patio door leading to the large back yard. To the left of the living area you will find all stainless appliances. Half bath and door to 2-car garage located just off the kitchen. Heading upstairs you'll walk into a lovely hall area overlooking the living room with a bedroom to the right. Another bedroom and master to the left. Master has own bathroom and walk-in closet. Lovely yard with gardener included! Home comes wired for security cameras and alarm system - available to you for low price and very minimal set up. HOA with green belt for morning strolls, Tennis court & Pickle ball court also part of the great community this home is a part of. Excellent Walnut Creek schools - Valle Verde, Foothill & Northgate High School. Small or medium dog with additional security deposit. Walk into this great 2 bedroom 2 bath apartment and enter into a very large living area with a connecting dining area. The fully equipped kitchen has a cutout that looks into the living room. Two carport parking spaces included - one covered and one uncovered. Trash and Water included with rent. Close to 680 and 4 freeways shopping and around the corner from the Contra Costa Canal Trail. You will absolutely love this beautiful, completely remodeled exquisite 2bd/2ba townhome close to Downtown Concord, BART & Freeway access! Enter to a hallway to find a door to the left leading you to a 1-car garage. To the right you will enter a totally remodeled living room with wood burning fireplace and open kitchen. Kitchen includes all upgraded and modern appliances including gas stove. The door off the kitchen leads you out to the enclosed patio area. Mid-level you will find the first large bedroom with a full bath located in the hallway. Head up three steps to the top floor and you will find a large master suite with a full bathroom. The walk-in closet includes upgraded built-in storage. As you enter into this updated open single-story home you walk into the bright and spacious living room that leads to the kitchen. On one side you have the designated dining area. Kitchen has an electric range double oven dishwasher NEW fridge and plenty of cabinet space. Just down the hall are the four bedrooms and and two bathrooms. Master bedroom has access to the backyard and has its owner master bathroom with double sinks. There is a bonus room that could be used as a fifth bedroom or office space (no closet). The master bedroom opens up with nice double doors and private sliding door that leads to the backyard. There is a large fenced in backyard with plenty of trees for privacy. 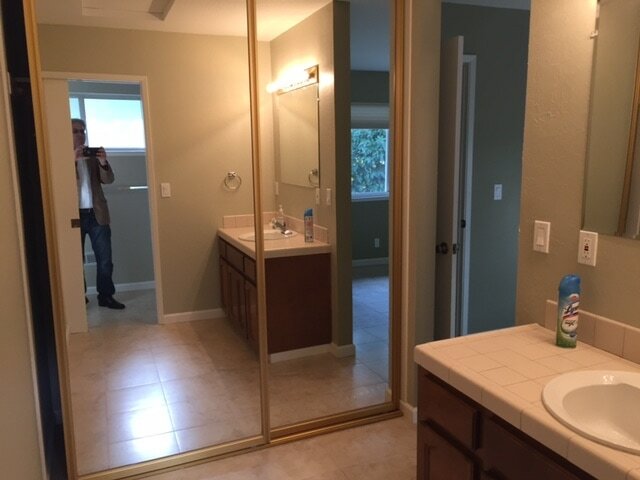 This beautiful and bright 3 bedroom and 2.5 bath home built in 2007 is conveniently located in the San Marco area of Pittsburg off of West Leland walking distance to the BART shopping and close to freeways. Walk into a large living room and open dining area and kitchen. The floor has been upgraded to marble. The kitchen has all modern appliances including refrigerator stove and dishwasher. A half bath storage area and large two car garage are on the ground level. The patio area is off of the dining area. Gas fireplace in living room. Go upstairs to the three bedrooms. Beautiful master suite with large bathroom and closet. Beautiful, bright 2BR & 2BA condo, upscale living in downtown Walnut Creek at the Mercer Building. You will love this condo in downtown Walnut Creek at 1655 N California Blvd. It is two blocks from the Walnut Creek BART station across the street from the Lesher Center for the Arts and three blocks to Civic Park and Iron Horse Trail. This condo is on the top floor (4th floor) with high ceilings and 2 large bedrooms and 2 modern bathrooms (1198 sq ft). In the Mercer complex the condo is on the quiet back side of the building; it does not face a street or the pool area. Walk into the condo and the kitchen is on the right with granite countertops and all modern upscale appliances (Bosch SubZero). The kitchen opens up to a very large living room with a fireplace and balcony. To the right is the beautiful master bedroom suite. A large room with a beautiful master bathroom with a separate bathtub and shower and double sink. The other bedroom is on the other side of the living room. There is a modern hall bathroom and a laundry room with a washer and dryer. The condo comes with two parking spaces and storage area. The Mercer is a doorman and gated building with elevators an indoor parking garage large swimming pool spa BBQ grill area fitness center and club house. ​Walk inside this beautiful home to an open landing area that leads to a large living room with a wood fireplace. This living area opens up to the dining area and the open kitchen with all stainless steal appliances. To the right of the living room is another room that can be used as a family room and a half bath. End unit with a private backyard facing the open space. Walk into a lovely living room with cathedral ceiling wood fireplace and private deck. Half bathroom on this floor. Go up a few stairs and there is a large dining room overlooking the living room. Past the dining room you will find to the left a large eat in kitchen with all appliances. To the right is a family room. Go upstairs to find 3 very nice size bedrooms with a hall (Jack and Jill bathroom) and a master bathroom. Downstairs is a large 2 car garage with a washer and dryer. House has dual thermostats for energy efficiency. Forced air heat and air conditioning. Top Danville schools walking distance to great shopping and access to freeways. You will love this beautiful house with 3 bedrooms & 2.5 baths with vaulted ceiling and large family room. Lovely backyard, 2 car garage in a pleasant area in Antioch. Enter into a hallway that adjoins a nice living room with vaulted ceilings. To the right is the staircase that goes up to the bedrooms. Straight ahead goes to the large family room that is open to the very nice kitchen. The kitchen has all appliances including a gas stove, refrigerator and dishwasher. The patio door opens to a very nice and large back yard with a deck and shed. There is a half bathroom downstairs. The two car garage is attached to the house. Upstairs are 3 very nice sized bedrooms and two bathrooms. The master has a large walk in closet. You will love this 1 BR & 1 BA condo with a patio & covered parking in Concord. It is in a gated community with great access to shopping and freeways. It is on the ground floor and there are no steps to entry. Walk into a tiled hallway and to the left is the nice sized living room. The patio door opens to the patio. From the hallway is the nice kitchen with granite counters and a large pantry. All appliances are included - Refrigerator, stove and dishwasher. The bathroom has been completely remodeled. Wall air conditioner in living room and ceiling fans in apartment. As you walk into the home you are welcomed into the front living area with a fireplace and high ceilings. To the right is the designated dining area. As you continue on the ground level you will find the updated kitchen with an island, stainless steal appliances, and plenty of cabinet space. Another living area is attached to the kitchen. Also on the ground floor is a half bathroom, laundry room, and entrance into the two car garage. Upstairs you will find both the spare bedrooms, a full hall bathroom and a beautiful master bedroom with bay windows, a large walk-in closet, and a nice master bathroom. Both the master bedroom and the backyard have beautiful views of the golf course and of the mountains. Walk into this great single family home that is located in a convenient part of Concord. As you walk in through the front door you are greeted by a bright living room with a fireplace and beautiful hardwood floors. The living room is connected to the designated dining area and has multiple windows and a glass sliding glass door to the big backyard that adds a lot of natural light. To the left of the entrance is the updated kitchen with granite countertops, stainless steel appliances and a gas stove. As you go down the hallways you will find the two spare bedrooms separated by a full hall bathroom. At the end is the master bedroom with a master bathroom. All beautiful wood floors throughout the bedrooms. Walk into this gorgeous 5 bedroom home built in 2015 and step into a spacious living area with granite counter tops, an island, and plenty of cabinet space. Around the corner is the designated dining room area. The living room is very bright and spacious with windows and a sliding door to the backyard and an electric fireplace. One bedroom is located on the first floor as well as a full bathroom. Upstairs you have the 4 other bedrooms and the other bathrooms. The master bedroom is very spacious and has a gorgeous master bathroom with tub and huge walk-in shower. The master bedroom closet is so big the current occupants use it as storage and an office. ​You will be amazed by this home built a year ago with 4 bedrooms and 2.5 bathrooms. New development on Harbor St by shopping centers in Pittsburg. Walk into a lovely hallway with wood floors and go straight down the hall to the living room and new, modern open kitchen with all appliances. The patio door leads to the back yard. Before the living room is a room that can be for dining or office/den. There is also a half bathroom on this floor. Go upstairs to the 4 bedrooms and 2 baths. Fabulous master suite with large bathroom and walk in closet. This house can be rented with some furnishings if desired. Walk through the front door and enter into a beautiful atrium area with three access points from the home. Through the main door you enter into the main living area that has a fire place and plenty of natural light. Next to the designated dining area there is the updated kitchen with granite countertop, nice appliances, and a breakfast bar. Down the hall you will find all four bedrooms. One room has a private bathroom and access to the backyard while another one has access to the front atrium. Washer dryer hookups are found across the hall from the hall bathroom. One car garage, one covered carport and room for two more cars in the driveway. You will love this very lovely 3 bedroom and 2 bath home with large 2 car garage lovely private backyard that backs up to open space. No neighbor behind you! Walk into the first floor that has a living room or all purpose room to the left. The large washer and dryer room is off the hallway. Washer and dryer included. Door to the garage is on this floor as well as a large storage area under the stairs. Go up the stairs to a very nice kitchen with all appliances including a dishwasher stove refrigerator and microwave. Off the kitchen in an open concept is the very large living and dining rooms. The patio door leads out to the beautiful private backyard that backs up to open space. Walk into this beautiful and spacious 4 bedroom home and enter in a good sized living room with fireplace. Around the corner is the designated dining area that is attached to the open and updated kitchen with granite countertops and stainless steal appliances. Four very nice sized bedrooms as well as an office/den area downstairs that leads to the backyard. Great sunroom with views of the surrounding nature around the home. Good size backyard that wraps around the home. You will love this 3BR and 1BA house that has been renovated and has an open floor plan. It is in excellent condition. Located close to the BART, freeways and shopping near Port Chicago and N6th St. Walk into a large living room that is open to the remodeled kitchen with all appliances including a refrigerator, gas stove and dishwasher. Plenty of counter space. The two car garage is attached and the door enters into the kitchen area. There is also a patio door that goes to the large, fenced in backyard that wraps around the house. From the living room the hallway leads to the 3 nice size bedrooms and the remodeled bathroom. 2 bedroom 1 bath condo in Marina Bay located on the second floor. Enjoy Granite counter tops, a fireplace, and a bright modern appeal. This unit has a large living room with a separate dining area and a kitchen with all appliances (except an oven). Three nice size bedrooms with carpet. This Gated Community consists of two pools, tennis courts, full gym and workout studio, and clubhouse. You will be assigned one covered carport. This unit is has a patio with additional storage. Perfect home in a great community! You will love this house built in 2006 walking distance to the BART, shopping and freeways. This is a two story home with dual zone heating and AC. Walk up to a porch and enter the front door hallway with a living room on one side and a family room on the other. Go down the hall and to right is the modern kitchen with all stainless steel appliances, a half bath and a dining area to the left. The two car garage is through the door at the end. Through the dining area there is a patio for BBQing. Upstairs are the 4 bedrooms and 2 baths. Downstairs is wood flooring and upstairs is carpeting. The master bedroom has a bathroom and a walk in closet. Walk into this great 2 bedroom 2 bath apartment and enter into this very large living area with connecting dining area. The fully equipped kitchen with all appliances has a cutout that looks into the living room. Two spacious bedrooms are on either side of living area. The master bedroom has a master bath and their own private entrance to the balcony. The second well sized bedroom is located next to the hall bath towards the entrance of the home. Close to 680 and 4 freeways, shopping, and around the corner from the Contra Costa Canal Trail. This lovely house was totally remodeled a few years ago with granite kitchen and new bathroom. All new wiring and plumbing. Kitchen has all appliances including dishwasher. 2 bedrooms with a living room and family room. Laundry room with washer and dryer hook ups. Big garage with lots of storage. Conveniently located on 32nd St one block from San Pablo Ave. This lovely house is the upper level of a duplex though it is on the street level so very easy entry. Other unit is downstairs and is occupied. Walk into a nice size living room with a wood fireplace. The entry to the garage is to the left. The living room opens to a very nice and god size eat in kitchen with all appliances. Down the hall are 3 bedrooms and 2 baths. The 4th bedroom is a very nice room downstairs away from the rest of the house. Great for an office, den, bedroom, guest room or music room. Available second week of June. This pristine single family home is located in coveted Southampton subdivision. It includes 4 bedrooms and 3 full baths on 2 levels. The lower level includes three bedrooms and two full bathrooms, one of the lower larger bedrooms has its own private bathroom and could be a second master bedroom. The upper level includes a very large master suite and a huge family room loft with expansive views of the open space adjacent to the property. The living room includes an updates gas fireplace insert and vaulted ceiling that looks up to the loft style family room. 2 car garage with washer/dryer. Walk between rose bushes and a gorgeous front porch into this great 2 bedrooms 1 bath single family home. As you go in the house you are welcomed into the living room that has a cutout into the kitchen. Kitchen has stainless steal appliances and ample cabinet space. To the left of the living space are the two bedrooms and the hall bathroom. Brand new carpet in both bedrooms. Out of the kitchen is a sunroom that is equipped with a sink. Through the sunroom is an entrance to very large and versatile backyard. Very close to Concord BART, Todos Santos Plaza, and the rest of Downtown Concord. This home is exquisite inside. Walk into a hallway and to the right is the remodeled large and open kitchen. The hallway leads to the 3 nice bedrooms and 2 bathrooms. The yard is quite lovely with 2 canopies and lots of open area and plants. A gardener is included in the rent. This beautiful and renovated townhouse is spacious with updated kitchen, W/D, 2 parking spots and private patio. Situated in a very private area in back of the San Marco complex on Montego near John Muir hospital and close to downtown Walnut Creek and BART. Walk into this lovely townhome and to the right is the very modern, updated kitchen with all appliances and granite counter tops. Straight ahead is the large living room with a fireplace. The patio door leads out to a very private, large patio area. There is one covered parking spot and a large parking lot for a second car. The swimming pool and clubhouse are nearby, as well as, the community laundry room. Beautifully kept grounds in a quiet surrounding you will love living in San Marco. ​Walk into this great 3br home and enter into a bright living area with a wood fireplace. Connected to the living room is the kitchen/dining area with all appliances included. A second living area with a second wood fireplace is in the back with a sliding glass door to enter into the very large and beautiful backyard. Large backyard with a gardener included. Empty flowerbeds for those who like to garden. Attached two car garage with a washer & dryer inside. Walk into this beautiful 3br 2ba townhome and in the upstairs portion of the home is a bright living area with gas fireplace, vaulted ceiling, and great views of the golf course and Mt. Diablo form the balcony. Attached to the living area is the spacious kitchen with a frigerator, stove, and dishwasher. Around the corner is the laundry area, a full bathroom, and one bedroom. Downstairs are two huge bedrooms connected by a full bathroom and a large walk-in closet. One of the rooms has their own private balcony with views over the fairway. Home does have stairs leading to the front door and stairs within the home. This unit has a large, open living area with a nice kitchen. All appliances including refrigerator, gas stove and dishwasher. The living room and 3 bedrooms have a beautiful wood floor. Elevator building with this condo on the 2nd floor. ​Walk into a good sized living area with large storage closet. As you go further into the home you reach the kitchen with newer granite counter tops, brand new refrigerator and the full bathroom. Past the kitchen you arrive to the 1 bedroom and closet area. One off-street assigned parking spot behind a fenced carport. You will love this beautiful, bright and updated 3BR & 2BA single story house with a two car garage & lovely back yard in great neighborhood off of Morello in Pleasant Hill. Walk into the hallway and the dining area is to your right and the living room to your left. Past the dining room is the spacious, modern, updated kitchen with all appliances. The kitchen opens up to a very large vaulted ceiling family room that goes to the very large back yard. The attached garage entry is just off this room. The washer and dryer are also her. The hallway from the kitchen winds around to the 3 nice sized bedrooms and 2 baths. Great location close to shopping, freeways and 5 minute walk to school. When you walk into this beautiful and spacious 3br 2ba home in Concord a living area with a fireplace will be to your left. Connected is a separate dining area that is attached to the fully equipped kitchen and breakfast bar. Further down is an even larger living area that has two access points to the large yard. Opposite the living area you have the two spare bedrooms and the hall bathroom with double sinks. As you wrap further down the hall you end at the large master bedroom with its master bathroom and its own entrance to the backyard. Backyard has many different fruit trees and has a very happy balance between earth and cement. Washer/Dryer are included and are found in the two car garage. Walk into this Beautiful, Bright, Spacious and Modern 5br 3ba home built in 2006 in the San Marcos area of Bay Point. You enter into a large, open dining and living room area. Down the hall you enter into another large family room that is open to the updated kitchen with abundant counter space and an island. Also on this level you also have one bedroom, separate laundry room and a full bathroom. Upstairs is the large master bedroom with very large master bath, walk-in closet and separated bath and shower. Three other bedrooms and hall bath are on this level. Home is fully solar powered so electric bills is only $80 a month and also has a soft-water tank Large versatile backyard Gardener included for front yard only and comes every 2-3 weeks. Walking distance to the BART and shopping center with Safeway. Minutes to Hwy 4 and Bailey Rd. or Willow Pass Rd. Located on Alves Ranch Rd. Walk into the very bright and spacious 3 bedroom 2 bath apartment and enter in an open and large living area with a wood burning fireplace. As you approach the bright living area the kitchen is to the left, equipped with stove, refrigerator and dishwasher. A wall cutout lets you see into the dining area and into the living area. As you go through the hallway you will find the two bright spare bedroom separated by the laundry rom (wash/dryer included!) and a full size bathroom. Around the corner you will find the large master bedroom that has an attached master bath, walk-in closet, and a private entrance to the balcony. Entrance to the very large balcony are located in the living room and the master bedroom. ​You will love this beautiful 1 bedroom cottage with views and privacy. High 25 foot ceilings, private patio, wrap around deck and garden with great views make this a one of a kind place to live. Close to Orinda Village and freeway. Air conditioning and one parking spot only. This house was newly renovated with a brand new kitchen, bathroom, wooden floors, double pane windows and more. walk into a large living room with wooden floor and double pane windows. This leads into the newly renovated kitchen which is all brand new. New gas stove, refrigerator and granite counter tops. The two bedrooms are off of the living room with a fully renovated and new bathroom. This house is part of a duplex with a separate apartment (1BA & 1BR) in the back with its own back private entrance and parking. The one bedroom is rented already. This home is absolutely beautiful! Walk into the hallway and straight ahead is the beautiful brand new kitchen with granite Caeserstone counters, all stainless steel appliances including a French door refrigerator, stove and dishwasher. All tiled floors in the kitchen and bathrooms. Half bathroom downstairs and entrance to the 2 car garage. There is a back yard off of the patio doors. Upstairs are three lovely bedrooms and 2 bathrooms. Close to 680, 780 and Hwy 4, schools, parks and shopping. Easy drive to BART and the Benicia bridge. Walk into this fantastic 2 bedrooms and 2.5 bathrooms Resort-style condo in Dublin. Downstairs you will be greeted by a full sized kitchen with stainless steal appliances and granite countertops, living area, and a half bathroom. Upstairs you will find both carpeted bedrooms, the master bedroom with master bathroom and the second bedroom with a hall bathroom. Gated complex with pool, clubhouse, fitness center, house theater, conference room, underground garage/parking. Unit is close to the pool and clubhouse. Minutes from I-580, 680, BART and shopping. One bedrooms for rent in this lovely 3 bedroom and 2 bath home in great neighborhood in Concord This house is situated on a very private street off of Clayton Way in Concord. $825 per month with a $1,200 security deposit. A nice size bedroom that shares a bathroom with another renter. All renters share the very nice kitchen with all appliances and the nice living room and backyard. You will love living in this fabulous single story, 2 Bed Room & 2 Bath townhouse w/ garage, patio in Walnut Creek. Located off of Treat Blvd. and Bancroft in the lovely community of Rancho Dorado. It is walking distance to the BART. Great schools, canal trails, CountryWood S/C and tennis courts. Open the gate to a private open entry way. Open the front door and enter into a large living room and formal dining area. This leads into the nice eat in kitchen with appliances. Off of the eat in area is the 2 car garage. On the other side is the private patio where you can BBQ! On the other side of the living room a hallway leads to the very large master bedroom with its own bathroom. The other bedroom is on the other side of the hallway and a hall bathroom is in the middle. There is a swimming pool and tennis courts on the property. You will love this 2 bedroom & 1 Bath condo in the heart of downtown Concord Located right off Concord Ave near Salvio you are close to everything ? shopping, restaurants, transportation & freeways. The kitchen has been remodeled with granite and has all appliances; fridge, stove, dishwasher. There is a 30 foot deck off of the kitchen and master bedroom. Large size living room with wood floor. 2 bedrooms ? Master bedroom has an extra huge walk in closet Condo community has a swimming pool. Condo unit is 2 flights up and with no one above. You will love this great 3 bedroom & 2.5 bath two story house in Hercules located at the end of a cul-de-sac. This house has it all! Spacious 2 car attached garage, laundry room with washer and dryer, nice back yard, fireplace and more! Enter into a hallway that leads into the nice size living room and attached dining room and half bathroom. To the left is the spacious kitchen with all appliances and an area for a table which leads out to the very nice back yard. Gardener is included in the rent. Upstairs are the very large master bedroom with a bathroom with a double sink. There are 2 other god size bedrooms and the hall bathroom. The house is available to rent immediately! This lovely 2 bedroom 1 bath home in Walnut Creek is off of San Miguel Rd with easy access to the 680 freeway. When you walk into the home you immediately enter into the wood floor living room and dining room. Around the corner is the updated kitchen with granite counter tops, new appliances and views of the backyard. Down the hall is the updated full bathroom and two bedrooms. This lovely home is located in a gated community. Great Location near the freeway and Pittsburg BART. Walk into a spacious open concept living room, dining room, and kitchen. This living space has high vaulted ceilings, wood burning fireplace and an entrance to the the backyard. Kitchen has a refrigerator, dish washer, garbage disposal, and plenty of counter space. Down the hall from the kitchen you will find two bedrooms and the hallway bath. Both bedrooms have a nice brown carpet that matches the rest of the home. Separate laundry room with hookups for washer and electric/dryer. Great house with beautiful wood floors throughout. Nice porch overlooking the front yard. Enter into an open space to the living room and dining room. Living room has a wood burning fireplace. To the left is a nice kitchen with a gas stove, refrigerator and Dishwasher. The French doors lead to a large, pretty backyard with lots of room to play. There are 3 good sized bedrooms. The attached one car garage adds lots of storage space to the house. Washer & Dryer are in the house. 2 bedroom 1 bath condo in Marina Bay located on the second floor. Enjoy Granite counter tops, a fireplace, and a bright modern appeal. This unit has a large living room with a separate dining area and a kitchen with all appliances (except an oven). Three nice size bedrooms with carpet. This Gated Community consists of two pools, tennis courts, full gym and workout studio, and clubhouse. You will be assigned one covered carport. ​This unit is has a patio with additional storage. Perfect home in a great community! Conveniently located 10-15 minutes walking distance to BART. Nice park across the street and trail access. Walk into a gorgeous hardwood floor living room equipped with a surround sound system, fireplace, and a TV that stays with the home. To the right is the updated kitchen with connected bar-stool counter and all modern appliances. In the back is a very nice and quiet patio back yard. The stairs lead to the three nice size bedrooms. The master to the right has a modern upgraded bathroom and walk-in closet.